Just as things were settling down in the aftermath of a polar vortex in the Midwest, a new issue presented itself at Mayo Clinic's Rochester campus. And staff stepped up to meet the challenge. When the sun rose on Thursday, Jan. 31, staff at Mayo Clinic's Rochester campus found themselves on the tail end of an arctic outbreak of historic proportions. The mercury had dipped to 30 degrees below zero Fahrenheit in Rochester, Minnesota, that morning, but an end to the bitter cold was in sight. The weather forecast predicted a significant warmup later in the day. A sigh of relief and a 70-degree temperature swing were on the horizon. Members of the Healthcare Incident Command System — a multidisciplinary team that's mobilized when routine operations at Mayo Clinic are interrupted — thought everything would be back to normal by the afternoon. Then an alarm sounded on the twelfth floor of the Guggenheim Building. The incident command group had another challenge coming its way. Guggenheim 12 houses mechanical systems for the building that is home to an array of laboratories. Hundreds of Mayo Clinic research staff work in Guggenheim, studying everything from mechanisms of stem cell aging to viral and gene therapies. All three of the building's air handling units had frozen in the extreme cold. That meant a controlled air supply and climate control no longer were possible on floors 13 through 20. Joseph Schneider, unit head for mechanical systems in Facilities Operations, and Cameron Wood, heating, ventilation and air conditioning (HVAC) shop supervisor, went to assess the situation. What they found wasn't good. The water coils in the air handling units had frozen. They had to be thawed out, and then checked for leaks and repaired. It wasn't going to be a quick fix. And because all three units were out of commission at the same time, the usual option of using a backup unit was not available. That situation prompted a second activation of the Healthcare Incident Command System — this time with significant input from Hilary Blair, Research Operations administrator and Nicole Thome, biosafety coordinator. They had to figure out the answers to two important questions: Are staff on the affected floors safe? Is any research in danger? Most of the affected floors contain eight to 10 laboratories. In all, more than 300 staff member were thrust into uncertainty that morning. "I needed to get over there to understand the impact," Blair says. "Research typically isn't pulled into [the Healthcare Incident Command System], and we really appreciated the support structure they provided." Together with Thome and colleagues from Facilities Operations and Environmental Services, Blair made the first of many rounds at Guggenheim, carefully assessing the situation on each of the upper floors. "My concern was safety," Thome said. "If we have an HVAC impediment, is that going to change how we're working safely in the building?" Even though chemical hoods and ducted biosafety cabinets were technically working, it was decided to post signs asking staff not to use them. "The hoods would not have been functioning in a way that would safely ventilate chemical and biological substances," Blair explains. There also was concern about air pressure. Due to the unregulated airflow, hallway doors became hard to open or would slam shut, and elevator doors wouldn't completely close. Once the team established that staff members were not in any danger — though much of their work was halted — attention shifted to another concern. By noon, the focus was on the more than 100 freezers that contained samples and other substances for use in research experiments. "The value of those assets can't be overstated," Blair says. While the freezers kept running, the temperature in the rooms where the freezers were housed rose to over 100 degrees, due to the problems with the heating system. That put an enormous strain on the freezers' compressors, as they worked to keep their contents at 80 degrees below zero Fahrenheit. "If the freezers fail, and we have to clean them up and move the contents out of the building, we'd have to follow Department of Transportation regulations, which would present a huge logistical challenge," Thome says. 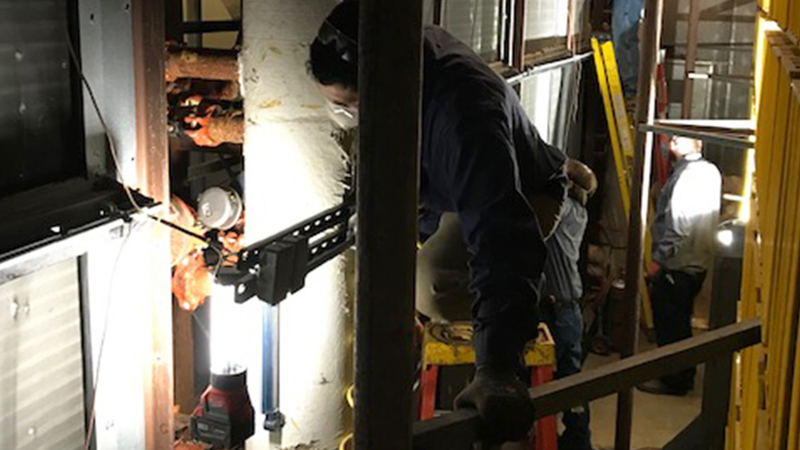 Blair and Thome put their confidence in their colleagues from Facilities Operations, who, together with a team of local plumbers and sheet metal workers, worked feverishly to get the first air handling unit back up and running. They succeeded. The first air handling unit came back online that evening. That seemed to stabilize the temperature in the freezer rooms. But it turned out that one revived air handling unit was not enough. "My heart sunk when the freezer rooms were still over 80 degrees," Blair says. "We needed to make sure these freezers weren't going to fail." Plumbers immediately began work on the second air handling unit. They worked through the night in an attempt to make the necessary repairs. But by Friday morning, Schneider had bad news. "Unit two had so many breaks in the water coils, they were not repairable," he says. "At that time, we decided to run the unit without the coils and try to repair the third air handling unit." After another morning of intense repair work, the picture looked much more hopeful. By noon, the second air handling unit was running again, albeit with reduced capacity. Nevertheless, the building was fully operational, and staff could resume their normal work. Plumbers continued to work throughout Friday and much of Saturday to repair as many of the coils as they could on the third unit. "I really have to commend the entire team," Schneider says. "They had to deal with an enormous amount of breaks that had to be repaired." Blair also has high praise for Schneider's team and the contractors who worked to get the upper floors back online. "They were very responsive and very communicative," she says. "We would not have gotten through it without them." Blair adds that many research teams pitched in to monitor temperatures. One supervisor even volunteered to spend the night in Rochester, in case things went awry. "The collaborative spirit from all involved, coupled with formal incident response processes, provided a foundation for effective coordination and communication, and successful recovery." Thome also praises Blair for her efforts as a "boots on the ground administrator" and points to members of the staff who were willing to walk the floors to protect colleagues, equipment and assets. And she's grateful for the support her team received from the Healthcare Incident Command System. "I was impressed," Thome says. "Research typically isn't pulled into that group, and we really appreciated the support structure they provided." That's great feedback for Byron Callies, Jr., from Mayo's Clinical and Business Continuity/Emergency Management, who served as incident commander when the Healthcare Incident Command System was activated. "A less-coordinated effort could have resulted in significant disruption or even loss of critical research," Callies says. "The collaborative spirit from all involved, coupled with formal incident response processes, provided a foundation for effective coordination and communication, and successful recovery." Thome adds that she was impressed with the process from beginning to end. "We really didn't lose more than one workday, and credit goes to the massive team involved." Check out Mayo Clinic's research laboratories.